Vietnamese demonstrators chant anti-China slogans during a rally in Hanoi marking the anniversary of a 1988 battle between Vietnam and China in the Spratly Islands, March 14, 2016. Plainclothes police in a port city in south Vietnam on Friday harassed and detained three people who attended a ceremony commemorating a 1988 Sino-Vietnam skirmish in the disputed Spratly Islands of the South China Sea, those arrested and other attendees said. About 50 plainclothes and uniformed policemen arrived at the site 15 minutes into the ceremony in Vung Tau, capital Ba Rịa-Vung Tau Province. They collected wreaths of flowers which attendees floated in the water at a beach, and detained three people—freelance journalist Suong Quynh, Facebook blogger Tam Ke, and Le Cong Vinh. “After the ceremony began, I saw many plainclothes police who tried to disrupt the ceremony,” Suong Quynh told RFA’s Vietnamese Service after she was released Friday evening local time. Le Cong Vinh told RFA that police tried to force him to sign a paper, but he refused. They then punched him twice in the face, and released him at 1 p.m., he said. Kim Chi, another attendee, told RFA that the government should have organized the ceremony. The Spratly Islands, which Vietnam calls Truong Sa and China calls Nansha, are a group of islets, cays, and reefs that form an archipelago in the South China Sea that lies off the costs of southern Vietnam, the Philippines, and Malaysia. The countries have jockeyed with China for control of the islands, which are located amid strategic shipping lanes and abundant fishing grounds, and may contain oil and natural gas reserves under the seabed. 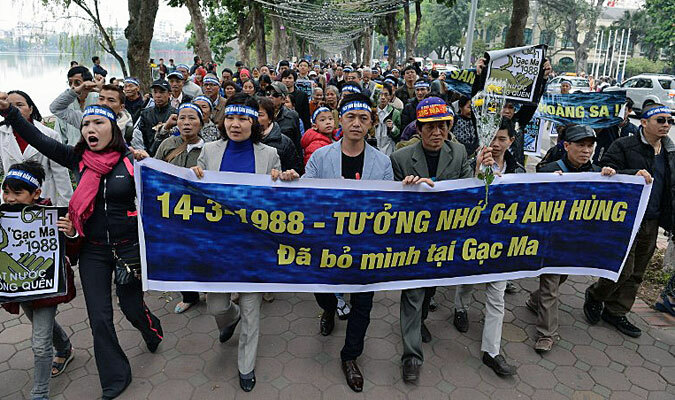 On March 14, 1988, the Vietnamese and Chinese navies engaged in a deadly skirmish near Johnson South Reef, called Gac Ma in Vietnamese, during which dozens of Vietnamese soldiers were killed and two Vietnamese ships were sunk. After the battle, China gained control of Johnson South Reef, despite ongoing claims by Vietnam and other countries in the region that the reef is part of their territory. Tensions between the two communist countries hit another high point in 2014 when China placed an oil rig in disputed waters, prompting protests across Vietnam. Chinese forces have also built a 3,000-meter aircraft runway on Fiery Cross Reef in the Spratly Islands to “maintain the safety of navigation” in the region and have attacked and chased away Vietnamese fishing boats, as they continue to assert their power in the South China Sea. Vietnam applauded a ruling by an international arbitration tribunal in July 2016 that said China had no right to resources within the nine-dash demarcation line that the Chinese government uses to mark its territorial claims in the South China Sea. The tribunal also ruled that China could not claim a 200-nautical mile exclusive economic zone around reefs and atolls in the Spratly and Paracel Islands, which Vietnam also claims. China seized the Paracel Islands, which it still holds, in a skirmish with Vietnamese forces in 1974 that left 75 Vietnamese soldiers dead. Vietnam continues to assert its sovereignty over the Spratly Islands, though China has dismissed the ruling by the international arbitration tribunal and continues its military buildup in the South China Sea. Vietnamese police routinely break up anti-China protests marking the anniversaries of the takeovers of the Spratly and Paracel islands and detain demonstrators. Is there any difference from Thai Thu To Dinh and Hanoi Thai Thu? Answer: There is no difference they all serve their Chinese Master. Mary Pham you brainwashed, abandoned child of war and raised by communist, why don’t you post something to verify your statements? You live in the country, gather some news to confirm your statement and debunk RFA! I’m talking about ‘1 stone for 2 birds’ scenario here. What can be better than this? It’s put up or shut up! BTW, I know you can’t for you don’t live in VN. The ‘party’ sent you here to infiltrate us. I know all about that. Eventually, ‘your superior’ will troll this website to ensure that you do your job. He/She will confirm your existence. Tell me that I’m wrong! Sounding like Sean Spicer doesn’t help either. Don’t let your dark past and lack of education make you a laughing stock. I would bet with you that 98% of VNmese oversea know about this w/out reading this article. This isn’t new. Before your ‘Party’, there were dictators, then Russians, and now the [Chinese]. We know of this practice since the 50s. Take your cheap acts elsewhere or impress me with something new. RFA again, desperately tries to frame this futile effort with "plain-clothed police", "harass"...while in reality, most Vietnamese are tired of faked demonstrations. Memorials are already built and events to honor martyrs, including those murdered at Spratly by Chinese - are very visible and integral part of Vietnam history and remembrance. I am not surprised if more disturbed ordinary Vietnamese will continue to react and stop these self-promotion and made-for-overseas media by faked "democracy" advocates!